Our afterschool program fosters independence, provides an organized time and space for homework, and allows students to socialize with their schoolmates and participate in a variety of hands-on activities in a comfortable and safe environment. This optional program is led by experienced members of our community who recognize the needs of students with learning disabilities. Afterschool staff members are MMFS community members: staff, teachers, alumni, and upper school students. 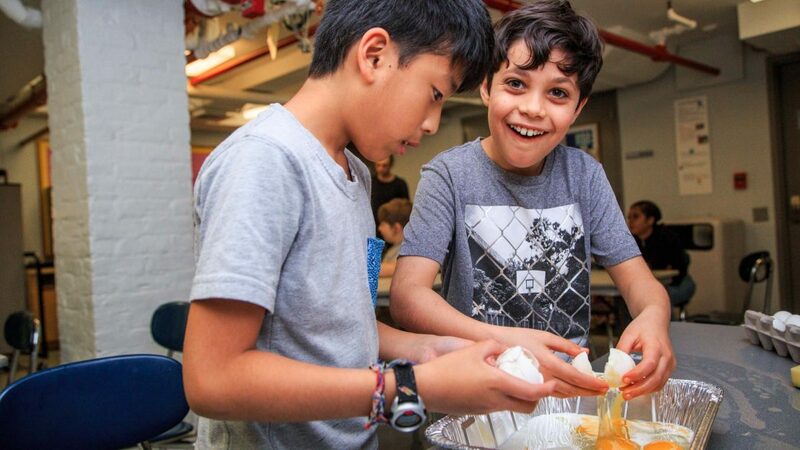 Students can choose to participate in a wide range of fun and creative activities including cooking skills, digital puppetry, yard games, theater, gym activities, scavenger hunts, and 3D object building. Lower and middle school programs are structured to meet the differing needs of younger students and adolescents. Lower school students start with free play, homework, and a healthy snack. Middle school students start with homework, enjoy healthy snacks, and may opt for a workshop or other program. An additional benefit is that many of the afterschool staff already know the students and their unique challenges and strengths, and are able to foster a fun and engaging space where students can continue to thrive. For more information on offerings and schedule, refer to the afterschool program brochures for lower and middle schools.